My child is missing another christmas at home while i am in court being lied upon, in New York,Long Island, Bronx,Queens,Brooklyn by ACS, by DSHS in Washington, Seattle,Oregon, Minnesota DHS, OKLAHOMA,TENNESSEE,Missouri,Michigan,OHIO. 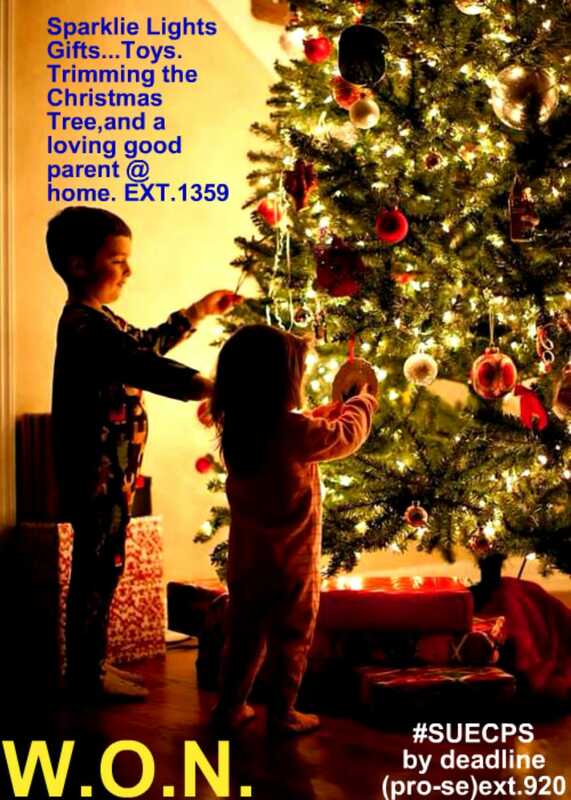 My child is spending christmas inside an abusive foster "stranger's home, in Arizona, Delaware, Pennsylvania,NJ. My child is sitting alone, at christmas while abused in a foster "stranger's" home,in CALIFORNIA,North Dakota,Connecticut. My child christmas present this year is being forcibly kept from me good parent without a legal basis to to do. My child is going on 1, 2, 3,4,5th year without a christmas with me. My heart is beyond broken as DHS,DFPS,,continue to violate us by forcing us unlawfully apart. Don't let it happen to you...Sitting "on net"complaining without strategic-action(timely AND properly applied when suing cps, shall get you no where you want to be.